I spent many hours gathering data and consumer feedback for this guide to the best under sink water filters in the low to mid price range. First there's a table comparing the five models. You can do a quick check of prices from there. Next is information about how these filters work and tips for choosing the right one for your needs. Then you'll find in depth information about each individual water filter followed by my final verdict. Spoiler Alert! ----> My Number One pick is the Propur PMC-4000. You can check out the price and availability right now at Amazon. In a hurry and don't want to read the whole article? Use the quick navigation below to skip to whatever interests you the most. What are the advantages of under sink water filters? What are the disadvantages of under sink water filters? Reverse osmosis vs filtration: What's the difference? What should I look for in an under sink water filter? Verdict: What's the best under sink water filter? As the name implies, an under sink water filter is installed in the space underneath your kitchen sink. Most models come with a mounting bracket so you can attach them to the cabinet wall. You'll also get tubing and fittings to hook it up to your cold water line. The cold water is diverted through the filter and out the faucet. It works totally by water pressure and doesn't use electricity at all. Some models have a dedicated faucet that you also have to install. Otherwise, the water will come out through the existing sink faucet. Saves Countertop Space - These filters go completely under the sink so you don't lose one square inch of your precious countertop space. Filtered Water on Demand - Unlike countertop gravity filters and pitcher filters, there's no waiting for water to drip through. Just turn on the tap and get filtered water instantly. Low Maintenance - The only maintenance you'll need to do is changing out the filter element(s) every now and then. Most models have a filter life of at least one year, so you won't have to do it very often. Effective - Whatever contaminants you're concerned about, you can find an under sink filter to take care of them. Not all brands are the same, though, so be careful. Variety of Options - There are plenty of types of under sink water filter systems to choose from to meet your specific needs. Some can be used in RVs or even as fridge filters. Good Value - True, the initial cost of these filters is higher than some other types, like faucet mount filters and pitcher filters. But, you save money in the long run because the filter elements don't have to be replaced as often. Takes Up Cabinet Space - You save countertop space by using one of these filters, but the trade-off is less storage space under the sink. May Need Separate Faucet - Some models require installation of a separate faucet for the filtered water. That might mean having to cut a hole in the top of your sink. Like the models in this review, a ​reverse osmosis (RO) system goes under the kitchen sink, and it has a dedicated faucet. But, unlike the others, an RO system has a semi-permeable reverse osmosis membrane that blocks up to 99% of most contaminants. Because it's so different from the other under sink filters, there aren't any RO systems included in this review. Please see my review of the best reverse osmosis systems if you'd like more details. This is the most important feature of any water filter. Almost any filter out there will remove chlorine and bad odors and taste. Maybe that's all you want. But, chances are, you're concerned about other contaminants that can affect your health. All filters are not the same, and they're not all equally effective. So take the time to investigate which contaminants are reduced and the per cent reduction that you can expect, based on independent laboratory testing. Don't buy a filter that doesn't reduce at least 90% of the contaminants that you're most worried about. Municipal water suppliers have traditionally used chlorine to disinfect the water, but some are now using chloramine in addition to, or instead of, chlorine. Both substances affect the taste and smell of drinking water. Most water filters remove chlorine, but many do not remove chloramine. So, you'll want to make special note of this when you're considering a particular model. If you're not sure which one is used to treat your water, contact your water utility company. They are required by the EPA to provide annual Consumer Confidence Reports to their customers. Most filter systems require filter element replacement every so often. That could be anywhere from every six months to three years, or even longer. Most manufacturers will tell you the average filter life expectancy. Several factors play into the longevity of the filter - the specific filtration media it uses, the volume of water you use, and the condition of your tap water, to name a few. Estimate how often you'll need to change out the filter for the model(s) you're considering. ​This will help you determine the ongoing cost of filtering your water so you can make an accurate overall price comparison. You don't want to spend money on a water filter and then find out that you can't find replacements anywhere. Before you click the buy button, make sure that there are replacement filters available in a brick and mortar store or online. Just like any other product you buy, take note of any warranty or money back guarantee offered by the manufacturer. The longer the warranty period, the better! One last item you'll want to check is the size of the system. Make sure you have enough room in the cabinet for the filter plus any existing plumbing. Pay special attention if you have a garbage disposal in there. Top of the list is the Propur Model PMC-4000 under counter water filter system. It clearly outperforms the other brands when in the types and amount of contaminants it can reduce. And it's the only one that removes fluoride. Propur, a company based in Michigan, is known for its high quality gravity water filter, along with other types of water filters for the home. This particular model is almost identical to the Propur countertop water filter. The setup is different, but, in contaminant reduction, the two are equal. ProMax High Efficiency Multi Stage Filter. The unique combination of filtration media yields superior contaminant reduction results. 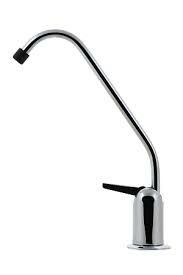 Lead Free Dedicated Faucet comes in chrome finish. Cabinet Wall Mount saves floor space under the sink. Dimensions: 4.75" diameter x 12.5" high. The Propur PMC-400 with its unique ProMax filter far outshines all the other under sink filters in terms of contaminant reduction. That's why it's at the top of the list. One reason I'm such a big fan of Propur is their transparency. Unlike the majority of water filter companies, Propur publishes independent lab test results for their products on their website for the world to see. According to the data, this filter reduces more than 200 contaminants up to 99.9%. *Note: The data sheet says it's for the countertop model. Both the under sink and countertop models use the same filter element, so the data is identical. The filter element will last for about one year for the average household. You should replace it when the flow of water slows down and/or the taste and smell start to degrade. You can click here to check availability and price of ProMax replacement filters at Amazon. If you opt for the extra pre-sediment filter, you'll need to replace that about once a year, as well. Check for availability at Amazon here. Propur offers a one year warranty on the system, excluding the filter. There's a 9 month warranty on the ProMax filter element. Bottom Line: The Propur PMC-4000 is for those who want an under counter water filter system with maximum protection from contaminants. It costs more than the other models, but it is clearly superior in effectiveness. Check the current price at Amazon by clicking here. 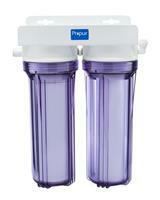 You can also buy the system and replacement filters directly from Propur. They offer free shipping, plus they accept PayPal and other forms of payment. Click here to buy the PMC-4000 at the Propur website. The CuZn (pronounced like the English word "cousin") UC-200 is one of the best selling and most popular under sink water filters out there. That's probably because it has a super long filter life, it's reasonably priced, and it does a decent job of removing many of the worst contaminants. Three Stage Filtration: sediment membrane; KDF-55; and coconut shell granular activated carbon. Bacteriostatic Filter inhibits the growth of mold and bacteria in the system. No Extra Faucet Required. So, all cold water coming from your regular sink faucet is filtered. No Maintenance Required. When the filter is used up, just throw the whole thing away. Easy Installation. 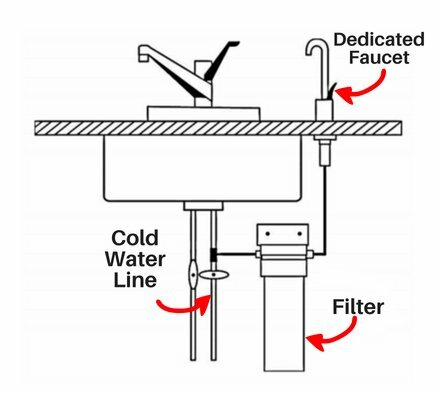 Simple to connect to your cold water line. Also, it stands on its base, so there's no need to attach it to the cabinet wall. Dimensions: 4" diameter x 15.5" high. All Parts Included. You'll get the complete filter assembly, brass fittings, and a 3 foot long braided stainless steel water hose. All you need to supply is an adjustable wrench to tighten the fittings. This filter is intended to be used only with chlorine treated water from municipal water supplies. It would be okay to use with disinfected well water, too. The CuZn UC-200 filter lasts for an amazing 50,000 gallons or 5 years, whichever comes first. This is great since there's not a separate faucet, and all of your cold water is going to be filtered. If you do the math, that works out to about 27 gallons of water per day. It's not likely you'll use even half that much. The best way to tell when the filter is used up is by the taste and smell. You could also use chlorine test strips to test the water. When chlorine starts getting through the filter, you'll know it's time for a new one. CuZn offers a 5 year warranty and 90 day "no questions asked" money back guarantee on the UC-200. So, there's really no risk in trying it out. The company is also well known for its excellent customer service. If you have any questions or problems, they are quick to respond and resolve your issues. 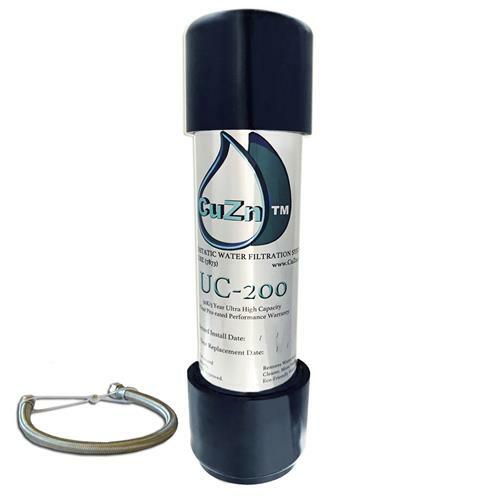 Bottom Line: If you're on chlorine treated city water and you don't care about reducing fluoride, the CuZn UC-200 might just be what you're looking for. Not having to install a separate faucet or trade out filter elements are big pluses. 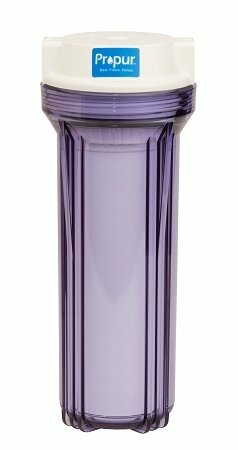 The long filter life and 5 year warranty also make it worthy of your consideration. Click here to check the current price and read the reviews at Amazon. 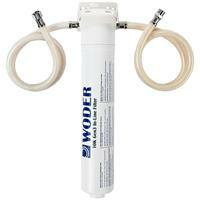 Next up is the least expensive of the bunch - the 10K-Gen3-DC water filter by Woder. It doesn't remove as wide a range of contaminants as the Propur and CuZn do, but the low cost and long filter life make it a popular filter. Granular Activated Carbon (GAC) removes many common contaminants. Bacteriostatic Filter keeps bacteria and mold growth at bay. Uses Existing Sink Faucet. So, no need to cut a hole in your sink top. Quick and Easy Installation. Takes 5 to 10 minutes on average to install. Attaches to cabinet wall. All Parts Included: Filter assembly, two 18" lengths of tubing, fittings and screws. This filter does a moderately good job of reducing some common contaminants. It should only be used with chlorine treated water. Everything else about other contaminants and per cent reductions is unknown. The manufacturer has not published any independent lab test data. I have requested that information, and if they send it to me, I'll update it here. This filter lasts a long time. It's good for 3 years or 10,000 gallons. Keep in mind, though, that since it uses the existing sink faucet, you'll be using filtered water every time you turn on the cold water. You get far less filtered water with the Woder than you do with the CuZn. Click here to check the price and availability of the replacement filter at Amazon. Woder filters come with a one year warranty. Bottom Line: The Woder 10K-Gen3-DC is a good budget friendly choice for those whose main concerns are chlorine and lead in the water. Click here to check the current price and read the reviews for the Woder water filter at Amazon. The CU-A4 water filter system is one of many offerings from iSpring, a family owned company out of Alpharetta, Georgia. This is the only model in the top picks that uses an UltraFiltration membrane, giving it the ability to reduce a high percentage of parasites and bacteria. 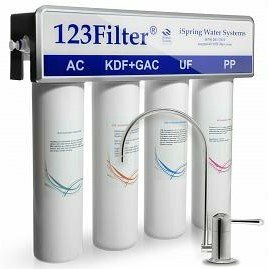 Four Stage Filtration: 5 micron polypropylene sediment filter; UltraFiltration (UF) 0.1 micron hollow fiber membrane; KDF-55 and GAC hybrid filter; and fine GAC filter. Optional Wall Mount. Filter assembly can stand on the cabinet floor or be screwed to the wall . Lead Free Faucet Included. Dedicated faucet means filtered water is not wasted during dish washing, etc. Color Coded Tubing ​​​​makes installation easier. Easy Filter Replacement. Filter cartridges twist on and off . Leak Proof Design. Water is routed in a way that prevents constant pressure on the filter. That means less chance of leaking. Dimensions: 10.5" x 4.5" x 12.5"
All Parts Included. Comes with filter housing, 4 filter cartridges, water faucet, 15 feet of 1/4" tubing, 3/8" feed adapter, and Snap-Fit connectors. This system should be used only with potable water. It does an above average job of reducing contaminants, thanks to the combination of the four filters it uses. ISpring had published lab test results on their website, so we can know how well the CU-A4 performs. Unfortunately, those results are no longer accessible online, but I did record some numbers. Three of the filter cartridges - all but the UF - need to be replaced about every 6 months. The UF filter lasts about 12 months. Fortunately, you can buy them in different combination packs, or separately, if you like. You'll get a 1 year limited warranty and free lifetime technical support when you buy this system. Bottom Line: The iSpring CU-A4 is a good choice if you don't need chloramine or fluoride filtration and you want some extra protection from bacteria and parasites. Just keep in mind that you'll have to change out the filters twice a year. Click here to check the current price of the iSpring CU-A4 at Amazon. Last of all, we've got the APEC WFS-1000. 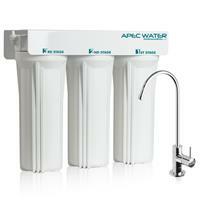 APEC manufactures a line of top notch reverse osmosis filters, but that's overkill for a lot of people. Sometimes you just want to get rid of the chlorine and make your water taste clean. That's what this system does, and very well, too. Three Stage System: polypropylene sediment filter and 2 carbon block filters. High Quality Lead Free Faucet. Attractive modern design with chrome finish. Optional Wall Mount. If you'd rather not attach it to the cabinet wall, it can stand on its own on the floor. Easy Filter Replacement. Twist off the filter housing, switch out the filter, and twist back on. Dimensions: 15" x 6" x 12"
All Parts Included. Comes with 3 filters, filter housings, faucet kit, feed water adapter, needle valve kit, 5 feet of 1/4" food grade tubing, housing wrench, and detailed instructions. This system is designed to be used with city water or well water (with the caveat that the well has been tested and found safe). You'll need to replace the filters about once a year, or after 1,500 gallons - whichever comes first. When the water starts to taste funny, it's time to switch them out for new ones. Click here check the availability of the replacement filters at Amazon. APEC offers a one year warranty on the WFS-1000 system along with lifetime support. Their customer service reps are WQA certified, so they know their stuff and can help you with any problems you might have. 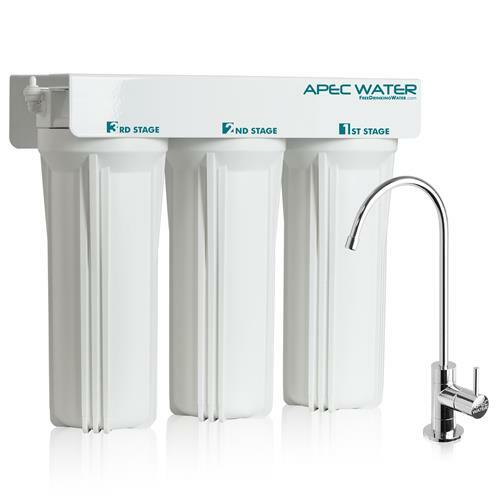 Bottom Line: If all you care about is making your water taste and smell good, then the APEC WFS-1000 might be the filter for you. It seems like a lot of money to pay for limited effectiveness, though. Click here to check the current price of the APEC WFS-1000 at Amazon. Phew! You made it to the end! That's a lot of information to digest. So, the question is: Which one should I buy? If you want the best protection from the greatest range of contaminants, the Propur PMC-4000 is my recommendation. Second best is the iSpring CU-A4. It's almost as good as the Propur, but it doesn't remove fluoride, chloramine or chromium VI. It also requires more filter changes, which makes it more expensive than Propur in the long run. If you want the cheapest overall, the CuZn UC-200 is the one to pick. It costs only a bit more than the Woder, but the filter lasts a good two years longer. It's not quite as good at removing chlorine and lead, though. I hope you found this helpful in your search for a new water filter. Feel free to ask any questions you might have in the comments below. I'll do my best to get back to you quickly with an answer.